The Hamilton District Main Street Program, in partnership with Cork & Cage Craft Bottle Shop, present the 3rd Annual Allentown Beer Fest. Join us in the 500 & 600 blocks of Hamilton Street for an afternoon of great beers, great food and fantastic music in our vibrant downtown! 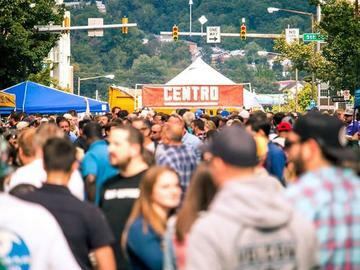 Allentown Beer Fest will feature even more beer with over 60 different breweries providing tasty craft beverages. Live music by Cunningham & Associates and Lazy Dogma will play all afternoon, and nearby restaurants will be selling delicious grub out on the street. Your ticket gets you a 3.5 oz tasting glass and a whole afternoon to try as many beer samples as you like (safely!) Live music will take place throughout the afternoon. If you would like to attend the Allentown Beer Fest to enjoy the music and food, you do not need to purchase a ticket. Age restrictions: Ticket holders must be 21 years of age or older. PARKING INFORMATION: Parking is available in and around Downtown Allentown, PA. We suggest parking in the garage located at 6th Street and Walnut Street. For more information please visit http://www.allentownparking.com/. We strongly encourage all attendees to arrive early for the best parking options OR MORE IMPORTANTLY, desigate a sober driver, take an Uber/Lyft, taxi, or bus, to and from the event!! Absolutely no refunds will be issued. Please purchase responsibly. We wouldn't be able to plan events like this in downtown Allentown if it weren't for the support of our incredible sponsors! Thank you, City Center Allentown, PPL, Cork & Cage Bottle Shop, Lehigh Valley Phantoms, PPL Center, City of Allentown, Green Mountain Energy, and LBJ Media! All ticket holders must be 21 years of age or older to sample.